Though originally I had planned to silk screen the acid resist for the angels, I think that in the long run reverting to the PnP Blue method of toner transfer that I’m already familiar will work out better. Like many users of PnP, I have been frustrated by the consistency of transfer. Sometimes I could get a really clean transfer and other times — total failure. The image below shows both. Also, most of the tutorials that I have read focus on PCB etching. While the principles are the same there are many tricks that I have found to adapt the basic techniques to larger scale, art etchings on brass. I’m taking notes and better quality photos. When I can catch my breath I’ll be writing a detailed tutorial for this method of resist toner transfer for artists. Left: What’s left of the PnP Blue carrier. 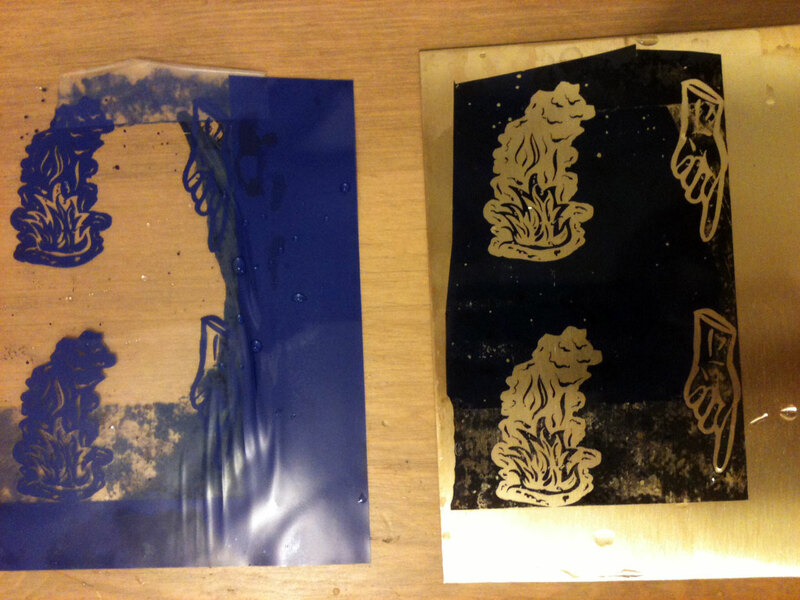 Right: Toner transferred to 20 gauge brass. This entry was posted in making and tagged brass, pnp blue, toner transfer. Bookmark the permalink. Looking forward to the process post. Me too. This 365 day challenge is a bit of a bummer in that I’m never completely satisfied with my posts but by year’s end blogging will certainly be a habit and then I can focus on quality in 2013. I’m pretty sure mine will slow down after the academic year begins, but that’s okay. I’m only posting once a week right now, and I’ll be fine if that gets cut in half. It’s made me draw and sketch and write more, and that is basically what I needed to get out of it.